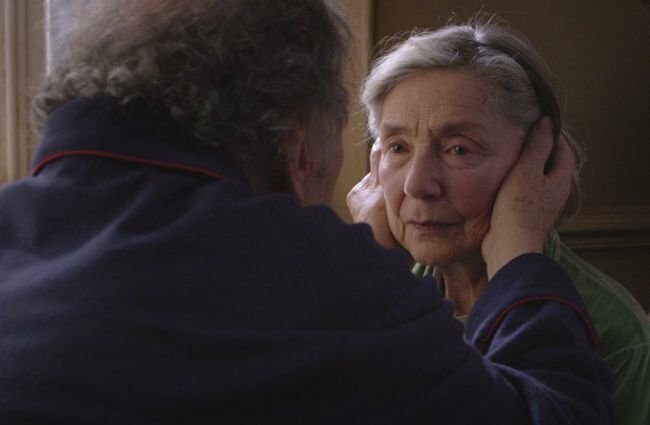 Compared to Haneke’s earlier works, Amour stands out for its astounding sensitivity and subtle tenderness, but ultimately, the story, which centres around 80-year-old retired music teachers George (Jean-Louis Trintignant) and Anne (Emmanuelle Riva), is no less hard-hitting. As the couple are faced with Anne’s physical and mental deterioration after two successive strokes, the film scrutinises, in a profoundly intelligent and unsettling way, the consequences of life and death, and the role that long-standing love plays when one half of an ageing couple is facing the end. As one would expect from a filmmaker as precise and skilful as Haneke, Amour is finely scripted, superbly composed, and often hauntingly beautiful and desperately sad. The quiet grandeur of the film, however, would be lost without its two main actors, whose astonishing, disarmingly honest performances breathe life into Haneke’s formal perfection in capturing the realities of terminal illness in meticulous detail. Crafted with passionate conviction and a mastery of film language, Amour is that rare work of genius: an acute philosophical inquiry that’s highly emotionally charged, but also dramatically gripping, incredibly discreet and utterly credible in its depiction of human behaviour. Pamela Jahn talked to Michael Haneke after the premiere of Amour at the 65th edition of the Cannes Film Festival in May to find out more about one of the most exciting films this year, and what makes a great director. Pamela Jahn: Amour is essentially a chamber play, and the apartment where the film is set feels very much like its own character. What role did the premises play for you in the story? Michael Haneke: The apartment in the film is based on my parents’ apartment in Vienna, which I had rebuilt in a French studio. We gave it a French atmosphere but the layout is the same. When you’re writing a film it’s easier to use a geography that you know so intimately. The film describes in a very sensible but precise way how an elderly couple deals with the ravages of old age and looming death. What made you explore that subject matter? Like I think all of us do, at some point in our lives, I knew someone in my family who I felt very close to and who I loved very deeply. But this person had to suffer for a long time and went through a lot of pain while I had to look on helplessly. This was a very difficult and disturbing experience for me and so it motivated me to write the script. But please don’t think that because it is the apartment of my parents this is also the story of my parents. It’s not. Was it difficult to get Jean-Louis Trintignant involved in the project? Amour is the first film he has made in years. Yes, that’s true, but it was not difficult to get him involved. I wrote the part for him, in fact, I wrote the script for him. And he had seen my previous film, The White Ribbon, which he liked, so it was actually quite easy for me to get him for this film. It seems like you wanted to work with him for a long time? Yes, I always admired his work. But the problem is always in finding the right part for an actor. I know many actors I’d like to work with, but I haven’t had the occasion to offer them what I think is the right part for them. In Jean-Louis’s case, because of the theme and the fact that you are dealing with elderly characters, he was the only person I wanted to work with in this film. In fact, if he hadn’t been available, I wouldn’t have made it. Hidden, for example, was a very similar situation for me. I wrote the film for Daniel Auteuil because I wanted to work with him. Why did you choose to make George and Anne music teachers, who have a very particular place in society? I wanted to avoid the danger of the film coming across as a social drama. I wanted to set aside any financial constraints, because if the film had been set in the working-class environment, people would probably have thought: oh, if they only had enough money, things wouldn’t be all that bad. But that’s not true, it doesn’t matter how much money you have, the situation, the tragedy is the same. Another reason why I wrote the film for a musical couple is because my stepfather was a conductor and composer, so again, it’s a milieu that I am familiar with and it is easier for me to describe the setting with the most precision and detail. You are widely recognised as a master of film language and the different aspects of filmmaking. What do you find most difficult as a director? Good question… The hardest part is probably not to feel nervous in the morning when you wake up. What do you do to avoid that? Nothing, unfortunately. The difficult thing is getting ready before the shoot. It’s similar to being an actor just before a theatre performance. Usually, the actor is terribly nervous while waiting in the wings but, as soon as the curtain goes up, he’s totally concentrated. It’s that constant stress that you feel on a daily basis and the fear that you are not going to be able to succeed and achieve what you are looking for. But unlike in theatre, where, if you’re rehearsing and something doesn’t work out one day, you can come back to it the next day and try again, you don’t have that luxury in film. You just shoot a scene on one day and if it doesn’t turn out the way you wanted it, then it’s lost, because you have to move on to the next scene. That’s one of the disadvantages of making films compared to theatre and opera. There is also this great story about Ingmar Bergman, that whenever he was shooting a film there had to be a bathroom nearby because he was so nervous that he needed to go to the bathroom frequently. I don’t know whether the story is really true or not but I can certainly empathise with this. You said elsewhere that you work better with your ears than with your eyes. How do you explain this? It’s because your ears are more sensitive than your eyes, or at least that’s the case for me. Sometimes when I look at a scene, I get too easily distracted by thousands of details. But when I don’t look, I hear immediately if there is something wrong with the sound or if somebody said something that is not quite right. There is also a simple example: if you need to loop a scene, which means if you are asking an actor to come back to the sound studio and re=record a sentence, that for some reason didn’t work out the first time around, people always think that synchronising the lip movement is the hardest part. But actually that’s the easiest part, because, as long as the lip movements match, it is credible for the audience. It’s the scenes that are off-camera, like voice-overs, that are the tricky ones because you immediately hear if the tone is wrong. In the many years I have been directing for theatre, I have often gazed to the ground while my actors were rehearsing on stage, not for the entire time of the rehearsal, but for parts of it, because I thought I could better comment on their performances that way. You mentioned Bergman before. How much of an influence was he on you, in particular in this film? I am influenced by Bergman in the same way that I am influenced by a number of different directors. In fact, I think it’s very important for a filmmaker to try not to be influenced by other people and rather find your own language. As an artist, your artistic equation is ultimately the result of all the other films you have seen, all the books that you have read, all the personal experiences in your life, everything really. And you should just try and do what you feel you have to do instead of asking yourself all the time what Mr X or Mrs Y would have done in that situation. But nonetheless, I think it is true that what my films have in common with Bergman’s is that they all focus on the actors, because that’s what interests me most. When was the moment you decided to become a director? Well, let’s say when I was 15 I was hoping to become an actor like my mother, when I was 14 I wanted to be a pianist and when I was 13 I wanted to be a priest. But as an actor, I wasn’t accepted at the academy, so I studied philosophy instead and did a lot of writing, short stories and a bit of film criticism. I was a terrible student though because I was in the cinema three times a day. Then, I went to television and became a story editor. I also worked in theatre for 20-odd years and at the same time directed films for television. And then, at the age of 46, I decided to make my first feature film. With hindsight, I think it is almost always very easy to draw some sort of red line through your biography, but I believe that in your life most things are determined by luck and coincidence, and the goals you set for yourself develop, just as you do along the way. Why do you refuse so vehemently to offer an interpretation to your films? If I were to explain things myself and offer an interpretation then this would automatically reduce the spectator’s ability to find their own answers. My films are offerings, I invite the audience to deal with them, think about them and reflect upon them and, ultimately, to find their own answers. I also think that an author doesn’t always necessarily know what he intends and what the meaning is behind his work. For example, I am always amazed by the many theses and books I read about myself, all of which reveal what I supposedly wanted to express in my films or was supposed to have dealt with. I strongly believe it would be very counterproductive for the audience if I were to answer the questions I am raising in my films, because then no one would have to think about them. Have you ever been disappointed by the reception of a film you made? Yes, Funny Games U.S. was pretty much a flop. Would you generally consider yourself a pessimist or an optimist? I don’t think I am a pessimist or that I have ever been a pessimistic person. If this was the case, I would only make entertainment films because I wouldn’t think that people actually care, and are intelligent enough, to want to deal with the questions I raise in my films. In that sense, I believe every so-called artist can only be an optimist, because otherwise they wouldn’t be motivated to try and ask questions and to communicate with their audience. A pessimist would simply say: it’s pointless, so I am not doing anything. Has your motivation to make films changed over the years? No, but that may be because I can’t really say why I am making films in the first place. Probably it’s because that’s all I know how to do.